It is a national park of Queensland, just an hour driving distance away from Cairns. It is part of the Wet Tropics World Heritage Area. 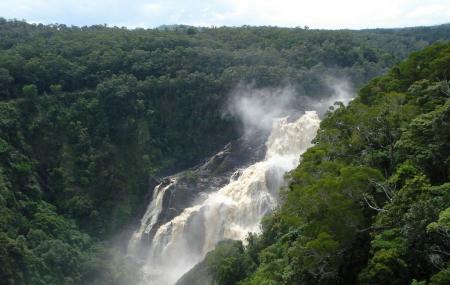 The famous Kuranda Scenic railway line passes through this national park with a stop at Barron falls. Permit and fees are required for commercial or organized activities. Domestic animals are not permitted. Carry water, wear hat, sunscreen and sturdy footwear. Be careful about stinging trees. Toilets suitable for wheelchair access are available. Picnic tables are provided at Lake Placid. How popular is Barron Gorge National Park? People normally club together Cairns Tropical Zoo and Sugar World Water Park while planning their visit to Barron Gorge National Park. People also prefer to end their day with Barron Gorge National Park. What an amazing place and when this is in full flood the power of water is truly visible. Can't thank my spouse enough for saying let's visit. So worthwhile. So if in Cairns ensure you go and if there in wet season well what a treat you are in for. We enjoyed the drive to the Barron Gorge, particularly as there were waterfalls spilling onto the road. It's a shame that the power station doesn't do tours and that the picnic facilities are getting shabby. However the river itself looks very clean and picturesque. Old fashioned train. Very good views on trip. Best train trip in Australia. Much better than Melbourne one. Biggest waterfall I have ever seen. An amazing amount of water pouring over the falls. A new viewing platform has opened to get close and personal to the falls and spray.